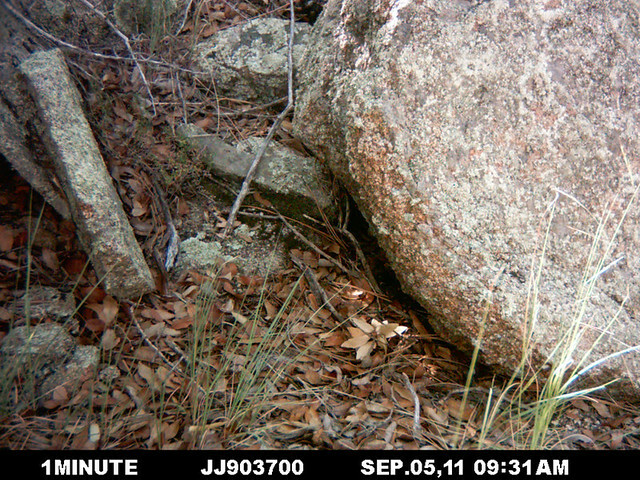 Squirrels and rattlesnakes have a complicated relationship. Some squirrels have developed resistance to rattlesnake venom so that an adult squirrel can survive a rattlesnake bite. 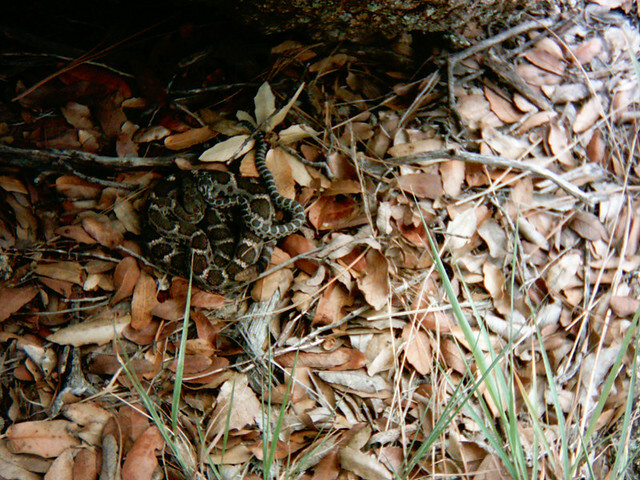 Juvenile squirrels cannot, so they are often still prey to rattlesnakes. Because of their resistance, adult squirrels will confront rattlesnakes that wander near their colonies and sometimes even kill them! We first met Sigma on 23 April 2011 when she was basking near her den. She was named for one of her many weird blotches that is shaped like the Greek letter. Sigma and Barb, 24 April 2011. Barb was born here, to another female (Devil Tail), the previous September (2010). 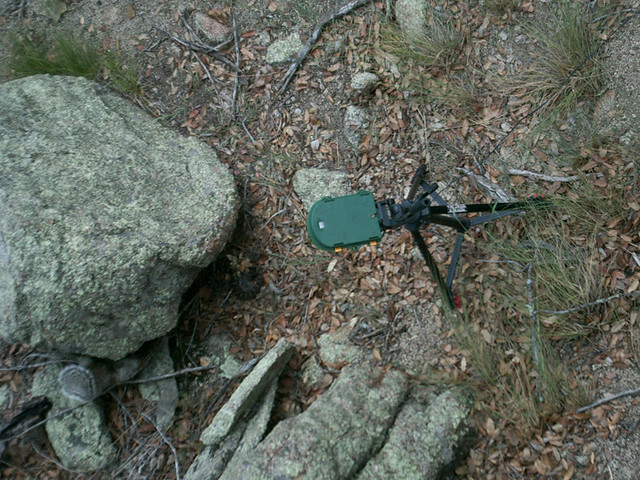 6 August: We return to the dens and find Sigma at large rock near her den that will be her nest site. Toward the end of her pregnancy, she settles on the west side of the rock as her main basking area, so we set up a timelapse camera there. Between 3 and 4 September, the squirrel appears to be investigating the nest rock, but never when Sigma is on the surface. This video captures Sigma’s family’s first day together (warning: its kinda long, 4 minutes). Watch for the squirrel’s appearance at 12:14PM. Timelapse video of 8 September. What starts as a peaceful day for the family was rudely interrupted by the squirrel at 11:27AM. 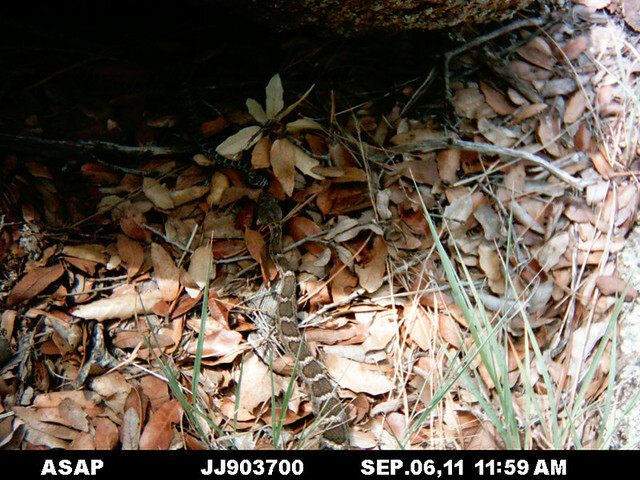 Just before the squirrel appears in the video, Sigma turns and assumes an S-coil defensive posture typical of rattlesnakes: she turns, expands her body to look as large as possible, and assumes a ready-to-strike (S-coil) defensive posture. What you can’t see in the video was captured by our overhead camera; Sigma is posturing to the squirrel just off screen. The family immediately disappears; Sigma reemerges only after the squirrel is gone. 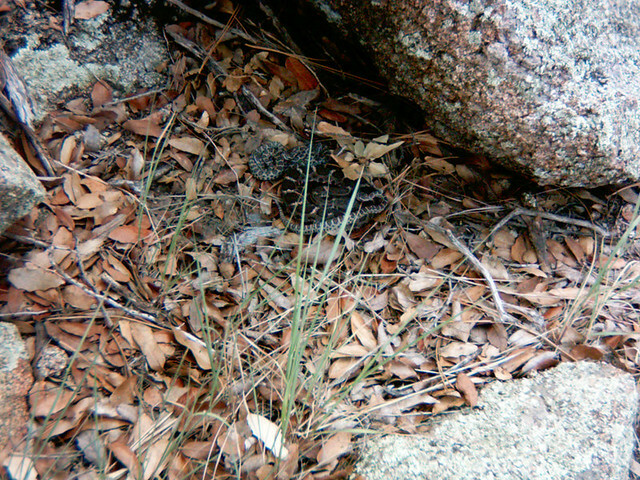 The first neonate to emerge is quickly chased back under the nest rock by the squirrel (~11:54AM–12:01PM in the video). 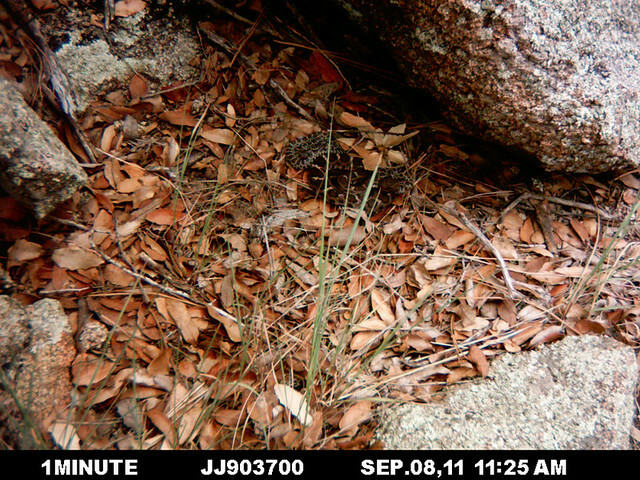 As it often did when there weren’t snakes visible, the squirrel appears to be looking underneath the nest rock. 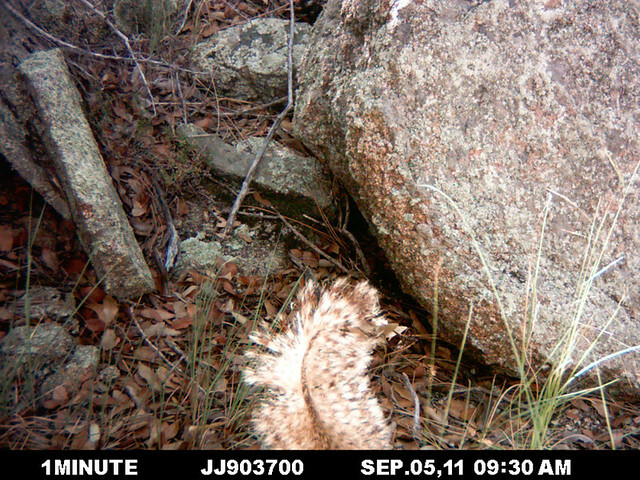 Sigma returns, takes on the familiar defensive posture and appears to be rattling – although it’s difficult to be certain because the timelapse photos were taken at one-minute intervals. Our camera continued to record at this location until 18 September and the squirrel returned about every other day, usually looking underneath the nest rock. Sigma and her four neonates were never seen together again, but we cannot say if they changed their behavior or if one or more neonates were injured or killed. One limitation of remote photography is that our knowledge is limited to what happened in view of the camera. 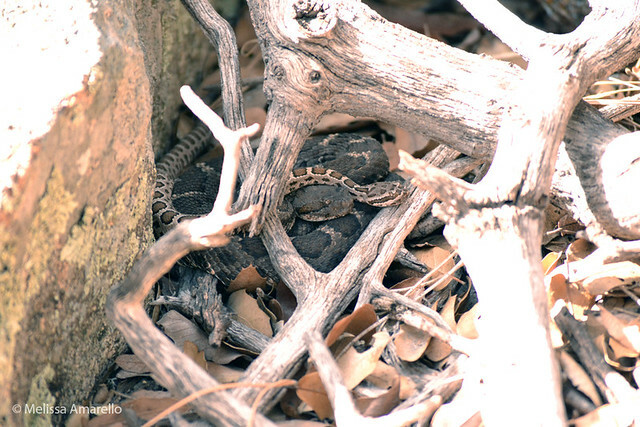 However, it is unlikely that any of these squirrel-rattlesnake interactions would have occurred if a human observer was present. We never saw anything like this when we monitored rattlesnake families in person – have you?